Location: Clergy Suite, 2nd Floor, Administration Bldg. Introduction to Judaism is an engaging and intimate 16-session course for anyone who wants to gain a deeper understanding of Jewish life through a Reform lens. Classes will be held on Mondays from 2:00–3:15 pm starting on Monday, November 5th, and continuing through Monday, April 1st. (No class will be held on Nov. 26th, Dec. 24th, Dec. 31st, Jan. 21st, Feb. 18th or March 25th. 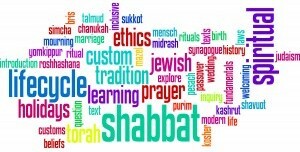 Classes will be led by Rabbi Rachel Greengrass, and are open to all. There is no charge for the course. This course is ideal for interfaith couples, those raising Jewish children, spiritual seekers, individuals considering conversion, and Jews who want a meaningful adult Jewish learning experience. Join a class where everyone and their questions are welcome. Topics include holidays, lifecycle celebrations, theology and core beliefs, prayer, the Bible and other sacred texts, history, anti-Semitism and the Holocaust, Zionism and Israel, and the experience of the Jewish people today.